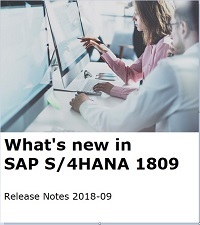 SAP has released the newest version of their flagship ERP software: S/4HANA 1809 (the version number 1809 refers to the actual release year and month, as in September 2018). SAP has committed to releasing a new version of its on-premise ERP system every year. Version 1809 is full of new functionalities, improvements and updates - all of which have been documented in a handy 770-page PDF document that you can download now. S/4 runs exclusively on SAP's new database called HANA (High Performance Analytic Appliance) - an in-memory database technology that allows the processing of massive amounts of data in real-time from memory (as opposed to hard disks), resulting in astonishing speeds.